PT Indah Karya (Persero) - PT IK or known as "Indah Karya" is a long standing state-owned engineering and management consulting company in Indonesia. Based in Bandung West Java, Indah Karya has a consultancy service that covers the following fields: Industrial Services (manufacture, chemical, pharmacy), PMC (Project Management Consultant) and EPCM (Engineering Procurement Construction Management). 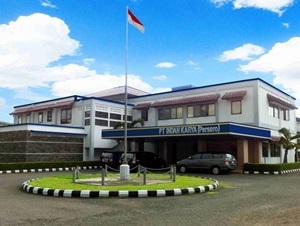 PT Indah Karya (Persero) was first established on 29 March 1961 and initially registered as PN Indah Karya. PT Indah Karya (Persero) was formed by the Government of Indonesia as a nationalization results of Dutch company Ingenieurs Bureau Ingenegeren Vrijburg NV (IBIV-NV) under the Government Regulation No 66 of 1961. The name of PT Indah Karya (Persero) officially launched in 1971. According to information found in the Company's website as cited by JobsCDC.com, PT Indah Karya (Persero) now has 4 business units; Consulting Division, Property Division, Industrial Division and IKRCS. TTMK : MIPA Chemical Engineering. Not older than 27 years (for S1) or 30 years (for S2) of age. Minimum accreditation college A and minimum accreditation major B. Minimum GPA of 3.25 from 4.00 scale. Fluent in English with minimum TOEFL certificate score 450 for S1 and minimum 500 for S2. Hnest, thorough and quick at work. JobsCDC.com now available on android device. Download now on Google Play here. Please be aware of recruitment fraud. The entire stage of this selection process is free of charge. PT Indah Karya (Persero) - Fresh Graduate Engineering Staff Indah Karya July 2018 will never ask for fees or upfront payments for any purposes during the recruitment process such as transportation and accommodation.